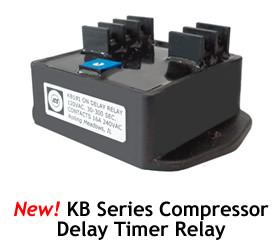 The ICS KB Series Compressor Time Delay Module protects the compressor from short-cycling of the control signal. The timer will insure a turn-on delay time of 30 to 300 seconds from when the control signal was set low. Adjustable Time Delay: 30 to 300 seconds. Delay Adjustment: Trimmer adjustment, also available with fixed delay. Timing Accuracy: ±1% @ 25ºC, ±5% @ -20ºC to +55ºC. Input Voltage Range: 85% to 110% of rated voltage. Contact Rating: SPST Contacts 15A @ 240VAC (resistive), 15A @ 28VDC (resistive). Options: Custom voltage and timing available. KB Compressor Timer Relay Wiring Diagram. KB Compressor Timer Relay Dimensions (in Inches).